When Melissa Keightley 16DPT meets new patients, she often begins by helping them with their breath before they attend to the body. Her patient population in Portland, Oregon, includes people living in poverty, many of whom are homeless. "Depression and anxiety are very common among these people," says Keightley. "Breathing and meditation practices can make it is easier for them to focus throughout the rest of our session." Keightley is using techniques she learned at Emory in the elective course Yoga and Meditation/Mindfulness in Emory's Division of Physical Therapy. 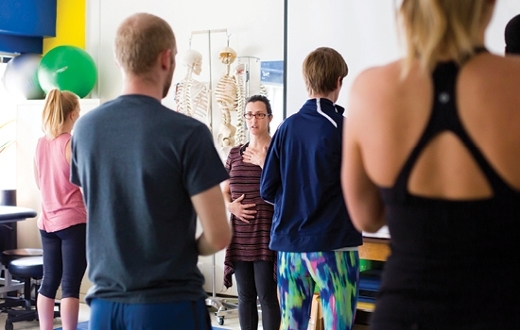 Since 2012, the course has been educating third-year students on how to incorporate mindfulness strategies into daily physical therapy work. The class is the brainchild of Professor Marie Johanson PT, PhD, OCS, who directs the curriculum committee. "We are always interested in evidence-based exercise philosophies and systems that complement 'traditional' therapeutic exercise," she says. "We had already had positive experiences with electives in Pilates and Tai Chi, so this seemed like an ideal addition." The teacher is Marlysa Sullivan, PT, a certified yoga therapist and registered yoga teacher recognized as an expert in the field of therapeutic yoga. As a physical therapist, she came to yoga therapy because she believed that helping patients with body-mind integration and stress levels would help people with complex conditions such as chronic pain. "Some people fully recover when you correct their musculoskeletal imbalance," says Sullivan. "But other people keep having the same issue come up. Yoga and meditation strategies can keep physical therapists within our scope of practice and still help us work with underlying nervous system issues, as well as mental and emotional components that perpetuate pain and structural imbalances." Students learn the history, philosophy, and neurophysiology of yoga, as well as practical ways to introduce patients to breathing techniques, yoga postures, meditation, and mindfulness. Sullivan and guest speakers also educate students about yoga and mindfulness interventions with specific patient populations, including orthopedics, neurology, traumatic brain injury, pediatrics, chronic pain, and acute care. The techniques typically induce a positive physiological response in patients. "Mindfulness and yoga practices create a parasympathetic relaxation response in the body," says Sullivan. "When we create that, the muscles relax and the mind and body settle. Once the body settles, we can do neuromuscular re-education." That training has come in handy for Katherine Krueger 15DPT, who took the course in 2014 and now works in an outpatient clinic in San Diego. "The concepts have helped me better understand and work with patient's symptoms and presentation," she says. "I am better able to problem-solve and tailor therapy to what the patient needs."